With the UK General Election just days away millions of people, including archaeologists, are making the final decision about which way to vote and why. However, there are relatively few people with a background in archaeology and heritage who have tried to enter public life by actually standing for Parliament as a candidate for one of the major parties, or even as an independent. 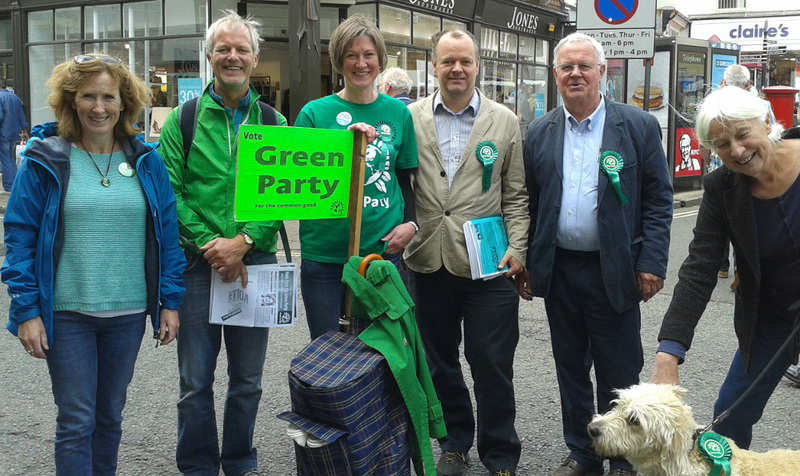 Late last week, Andy Brockman, Editor of thePipeLine, spoke to one who is; archaeologist and now Parliamentary Candidate for the Green Party in the town of Bury St Edmunds Suffolk, Helen Geake. Probably best known to the public through her many appearances on Channel 4’s “Time Team”, Helen has had a distinguished career in archaeology, including working for the Portable Antiquities Scheme as a Finds Liaison Officer and adviser. She is a Fellow of the Society of Antiquaries and a subject expert in Anglo-Saxon burial practices. She has also been a regional member of the Council of Rescue: The British Archaeological Trust. The conversation was undertaken by e-mail and is recorded here unedited. It took place before the atrocity at London Bridge on Saturday night. Archaeologists and archaeological organisations tend to try to stay above the cut and thrust of Party politics.and there are very few high profile archaeologists in political life at a national level, I think of Lord Renfrew who sits for the Conservative in the House of Lords and of course there is Baroness Jones, Jenny Jones, who sits in the Lords for your own party, the Greens and who has also had a substantial career in the London Assembly; what made you step up to try to join them? I think it was the experience of working for the All-Party Parliamentary Archaeology Group. I got involved with them in 2003, and it was a fascinating and exciting time researching what was wrong in policy terms with the way we ran archaeology. We ended up producing a fantastic report on how things could be made better, and set about briefing ministers and lobbying MPs. But no sooner than we had got one on our side than they would be re-shuffled, or there would be an election, and we’d have to start at the beginning again. So I thought, why spend all your time trying to persuade elected representatives – why not become one yourself? It took me a while to get started, because I had a small baby then, but better late than never! Of course once you choose to step up you have to choose a political party, or opt stand as an independent, what journey took you towards the Green Party? I think many people will be familiar with this sort of journey. I had always voted tactically, especially when I lived in the marginal seat of York. But I became disillusioned with the Labour party during the Blair and Brown years, with its constant obsession with the private sector. I had voted Lib Dem occasionally, but after the coalition – and especially the bedroom tax and the very unwise Health and Social Care Act 2012 – I felt politically homeless and began looking around for an alternative. If you want a society that works for everyone – with universal benefits depending on progressive taxes collected from the rich as well as the poor – then you have to vote Green. Of course it helps that Green politics are evidence-based and take the long view, and that they realise that the environment underpins everything. Archaeologists tend to understand evidence, the long term and the fundamental importance of the environment, so it’s not surprising that many of them join the Green Party. Since you first stood for Parliament for the Greens in the 2015 General Election we have seen the murder of Labour MP Jo Cox during the EU Referendum campaign. There has also been a perceived coarsening of the political process with the widespread trolling of candidates and the arrival of so called Post Truth Campaigning. Did those events make you think twice before opting to stand again in this General Election? I have, luckily, not experienced any of this. Here in Suffolk everyone is very polite, even on social media! But I know it does happen, and one factor may be our antiquated voting system. We only have one vote, which in most constituencies doesn’t count for much – here in Suffolk the Conservatives get half the votes but all the seats. In marginal seats, by contrast, every vote must be fought over and every vote for you is a vote against someone else. If we had a more modern proportional system where we could express our preferences, then the situation wouldn’t be so binary and it might result in more collaboration and less confrontation. Do you think archaeologists can or should be more “political”? I mean by that more involved in direct campaigning and opinion forming, with or without a party affiliation? I think everyone should be more ‘political’. Politics is the way we make our choices about how to run our society, and we should all get involved in this. Of course it can be difficult to argue for your special interest group when there are issues that are more important – nobody feels like fighting for archaeology policy in the middle of a housing crisis and education cuts – but if there aren’t archaeologists standing up for the historic environment and the museums sector, these essential aspects of a civilised humane life will get forgotten. For many commentators this has been a strange and unpredictable election campaign. How does it appear from your perspective in East Anglia, and how, if at all, have environmental and heritage issues played on the doorstep? You are absolutely right that it’s been unpredictable. Conversations that we’ve had one week with nearly every voter have been suddenly old hat the next week. But the environment stays quite close to the top all the time, because it’s so interwoven with everything else. Why is there so much demand for the NHS? Partly it’s air pollution and poor food standards. Why is our transport system so clogged? Because we don’t have a joined-up network of buses, cycle paths and railways to lower our carbon footprint – and take pressure off the roads. Heritage issues are another matter. The Green Party is still devising a heritage policy – it’s something that hasn’t been high on the agenda until recently. Where it is beginning to creep in locally is in the amount of housing development that we are faced with here in Suffolk. People don’t want their built heritage overwhelmed with large estates of poor quality housing. It’s easy to care about your built heritage when you see it every day – the challenge is to explain about the buried heritage too. One of the high profile issues which is in the political domain is the proposal for the so called short tunnel on the A303 at the Stonehenge World Heritage Site. What is the Green Party position on the Stonehenge proposals? Personally I have some sympathy with Dan Hicks, who has argued that to remove all the roads from the Stonehenge area takes something away from its history. I grew up in Bath, which has had a lot of its Victorian additions erased in the name of ‘conservation’, and has in the process lost some of its depth of character. Greens in general tend to point out that faster, wider roads attract more traffic, and continuing ‘improvement’ of our road network does nothing to alleviate the real problem of an unsustainable growth in car use. It would be more sensible to try to take traffic off the A303 and onto railways, rather than to transform the A303 into an ‘expressway to the south-west’. So I’m not surprised that the local Green Party, together with Rescue and the Stonehenge Alliance, plus a group of experts as reported by thePipeLine are against the tunnel as it is currently proposed. Rescue says that the current scheme “threatens our ability to investigate, understand, manage and enjoy the site properly in the future”. Back to the drawing board, I think. A recent report commissioned by the four UK academies, including the British Academy, suggested that a hard Brexit with no continued membership of EU programmes such as Erasmus+ could see research archaeology lose up to 38% of its funding. How would the Green Party respond to this scenario? We will campaign for any Brexit deal to include continued membership of EU research programmes, for continued freedom of movement and continued membership of the single market. Most importantly we are campaigning for a vote on whatever deal is negotiated. We will make a bad situation worse if we rush into Brexit without a proper debate about Britain’s future, and if we fail to give the public a say over whether to accept the final deal offered to us. Whoever forms the Government after the General Election what are your hopes and fears for archaeology and heritage during the lifetime of the next Parliament and how can archaeologists influence these? My fear is that archaeology and heritage will continue to be seen as luxuries which we don’t need. Cuts have already gone further than I thought possible in a country which valued its heritage for tourism, if for nothing else. There’s not much left to cut, but no doubt people will try. My (utopian) hope, on the other hand, is that if we do end up leaving the EU, we may be able to design our own agricultural subsidy schemes that prioritise the environment rather than industrial production, so we can use these incentives to protect buried archaeology on farmland. We lose so much to agricultural erosion, and we can see this when metal-detecting or aerial photography shows it up, but at present we can do very little about it. As for influence, more archaeologists need to keep an eye on what’s going on in Parliament and then lobby their MP. One of the best ways of doing this is to join Rescue – a small organisation but one which really punches above its weight. Rescue keeps you informed about what’s going on, and how you can help in practical ways. Finally, politics is ultimately about getting into power and passing legislation. If you could pass one piece of legislation related to archaeology or heritage on day one of a Helen Geake Government, what would it be? I think I’d have a go at something pretty simple on my first day. We need to put HERs on a statutory footing – in other words, to require local authorities to maintain an HER. Of course I’d include portable antiquities in the scope of the HERs. This has just happened in Wales – as of a few days ago – so it’s definitely achievable across the UK. And as my government would be Green, we would sort out sufficient funding by saving money, say by cutting the private sector out of schools and the NHS. On day two I might get a bit more ambitious. Does competitive tendering really give us the best possible results in advance of development? Why not try another model, such as a franchise for all the archaeological work in an area for a specific length of time. Franchises could be awarded to teams which include local professionals, universities and archaeological societies, and would mean that competition could be done on the basis of research quality rather than cost. This law might not be so easy to design, but we could perhaps get a Green Paper out for consultation within my first month! In the 2015 General Election Helen Geake also stood for the Green Party in Bury St Edmunds taking 7.9% of the vote, an increase of 3.6% on the party’s previous performance and saving her deposit. Nationally, at the time of writing [5 June 2017], the Green Party is polling around 3% of the vote. This is the full list of candidates who are standing in the Bury St Edmunds constituency at the 2017 General Election.